BandLab, the first free global, multi-platform (iOS, Android and web) cloud-based app where users can create, collaborate and share their music, today announced the release of Version 3.0, offering a range of exciting new music-making innovations for musicians and music lovers. Perhaps the biggest addition across all three platforms (iOS, Android and the web) is Shouts. 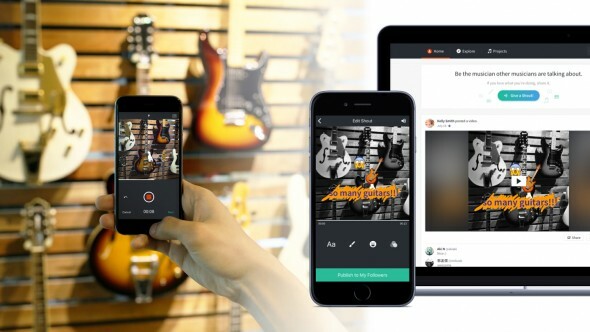 BandLab Shouts enable users to grab a video, snap a photo, add filters, captions, emojis or drawings, then publish their thoughts and share them with followers and friends. So every moment of every day, musicians in the BandLab community can share the things that inspire them and give insights into their creative process—and, as a result, inspire others. BandLab 3.0 includes new tools to make music like a new set of guitar effects turning any computer or mobile device into a guitar amplifier. The web app features 12 pre-programmed sounds, ranging from crunchy overdrive to spaced-out psychedelia. These effects can also be added as post effects to a recording in the BandLab Mix Editor. The web app is also where you’ll find an onboard drum machine, which offers over 18 different drum sounds and real-time control, allowing you to add or subtract beats ‘on the fly’. In addition, a whole new musical palette is being released in version 3.0. These new sound banks give BandLab users the opportunity to start making music with new virtual instruments such as brass and woodwind, marimbas, orchestral strings and new classic organ sounds. There are also additions to the number of piano sounds available. Finally, there’s also a new loop library that goes way beyond just drums. These new loops can be searched by genre or instrument—users will be able to find funk, rock, blues and more, then choose the instruments they want to hear them played on. Many of the enhancements made on the BandLab web platform are also planned for the mobile app in future. The iOS version of BandLab already has its own guitar effects. So now guitar players can simply connect to their phone, play and record with great tone—no matter where they are. BandLab is working on bringing this feature to Android users as soon as possible. The addition of these features, combined with the ability to write/record directly into the mix editor and chat in the in-app messaging system positions BandLab as a unique social recording software experience. While there may be other software companies out there that claim to do similar things, none can match the pure breadth of recording/editing tools, MIDI options and collaborative features in an easy-to-use, all-in-one multi-platform interface. All for free. BandLab’s ever-improving product features are only part of the reason the company has gained so many avid followers since launching in November 2015. This global community of musicians and fans is also highly diverse. BandLab is a free, all-in-one, cloud-based social platform that simplifies the process of making music. Its global community of musicians and fans work across iOS, Android and the web to create and collaborate on music, which is then shared with the global community. BandLab is part of BandLab Technologies, a connected ecosystem of brands covering musical instruments and accessories, web/mobile/social applications and commerce. Their collective expertise in software and hardware development—combined with an ability to connect directly with consumers through both digital and physical touchpoints—puts them in a unique position to shape the future of music.